Bioroids and Bombots: Megaphonon Underwater Weapon. A certain TV channel is currently reshowing “SeaQuest DSV”. Appropriate since the first season is set in 2018. When the series first ran an engineer friend of mine christened it “Dodgy Sea Vehicle”. We cremated that friend last year, so watching this series reminds me of a good friend whose wit and company I will no longer enjoy. 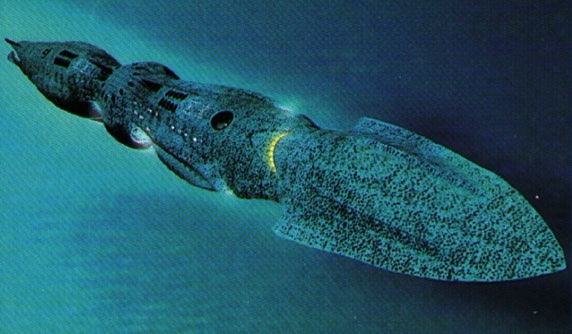 The armament of SeaQuest DSV was rather uninspiring, so this series also reminds me of a Daedalus post in “New Scientist” (25/6/1981). Daedalus’ posts were often tongue in cheek and many where satirical. About 20% of the ideas he suggested have been patented or proposed as serious proposals by other people. My own impression was that some of the more credible concepts may have been jokes that I lacked sufficient physics background to appreciate. Would the “megaphonon gun” or “cavitation cannon” actually work? If nothing else it might make an interesting weapon for a cinematic or super science campaign. Remember that the speed of sound underwater is higher than in air. Water temperature, salinity and pressure (depth) further increase the underwater speed of sound. Treat the velocity of a megaphonon as 1,650 yards/ second.